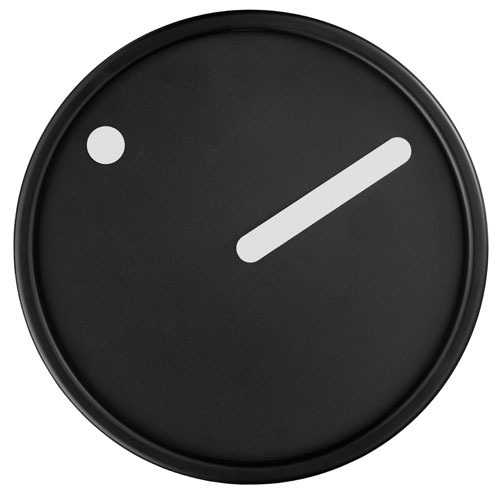 nova68 modern picto wall clock in classic black and white. the modern contemporary picto design clock was designed by danish designers georg christensen and erling andersen. inspired by the picto watch created in 1984 by steen georg christensen & erling andersen, the picto wall clock brings the same simple, minimalist style to your wall. picto, meaning "picture", features the same rotating face as the watch and uses a quartz movement. hours are marked with a simple dot while the minutes are counted by a traditional moving hand. the clock is glassless, leaving the face open and the design unmarred by light reflections. with strong, contrasting color combinations, the picto wall clock creates a distinct picture of time with each movement. when steen georg christensen and erling andersen designed the picto clock in 1984, they especially wanted to continue developing the conventional clocks design and they therefore concentrated on the form and the function. the designer duo furthermore wanted to create an “image” of the time. they were successful transforming the rosendahl picto into a modern classic. the graphic expression of picto is modern and minimalistic, which is why it is more contemporaneous than ever. more advantages of the clock are in the revolutionary, rotating dial, which makes picto remarkably different, even 30 years after it has been launched. the rosendahl timepieces picto wall clock’s dial rotates contrasting all the common clocks with ticking pointers – picto leans on the imagination of a rotating world and the time passing simultaneously. the hours pointer is a fixed element at one place of the dial, together with the “normal” minutes pointer they are the only elements of the clock. less is often more. the rosendahl timepieces picto wall clock is unique as a designer’s piece. they were for example completely designed without the common glass protection – a surprising and fresh effect, which emphasizes the rotating dial in front of a wall and which makes people stop and want to touch it in order to feel the time passing. the glass-less design moreover directs the attention to the contrasting colors of the hours and minutes pointer.